Clowning is a state of playfulness that brings us to experience a child-like, naïve and vulnerable state of being. Paradoxically we grow, learn and are strengthened through reconnecting playfully with what makes us most vulnerable. 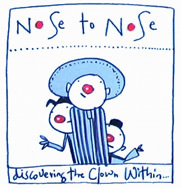 This approach to clowning is not a technique (tricks, gags and routines) but a personal journey towards finding one’s own unique way of being a clown, by listening and being receptive, essential skills for any creative and imaginative expression. It is only when we let go our control over things that we begin to be surprised by the depth of what reveals itself to us. Come for a day of letting go and freeing up!